This is my final installment of RomCon 2013 festivities! I left off on Tuesday with the events of Friday, June 22. Let’s take a peek at Saturday! Saturday morning breakfast started with a wonderful surprise! 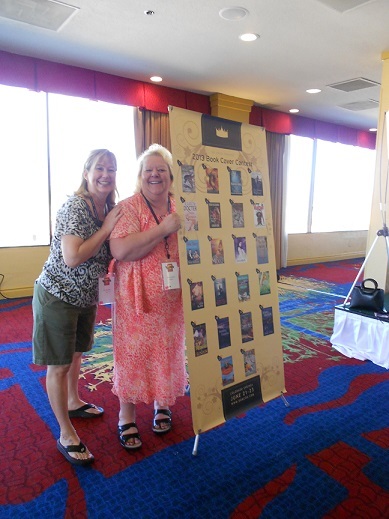 RomCon organizer, Michele Callahan, announced that SATIN PLEASURES was a Reader’s Crown Award finalist!! This contest was judged by readers and had to receive a score of 8.0+ out of 10 to be included in the finals, not an easy feat! I was thrilled that so many readers enjoyed Dan’s & Tess’s story. For some reason, I don’t have photos for the first two events I attended. Clearly, my camera was having issues. Or maybe it was operator error. Nah! 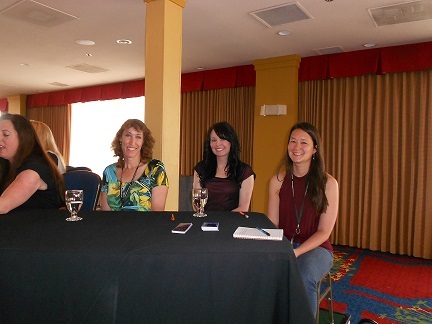 After saving the world, I moderated the Romantic Suspense Chat Panel with Allison Brennan, Heather Graham, Rebecca York, and Bob Mayer. Readers did not run out of questions for this wonderful group of authors and there was a lot of laughter thanks to the stories they shared with us. 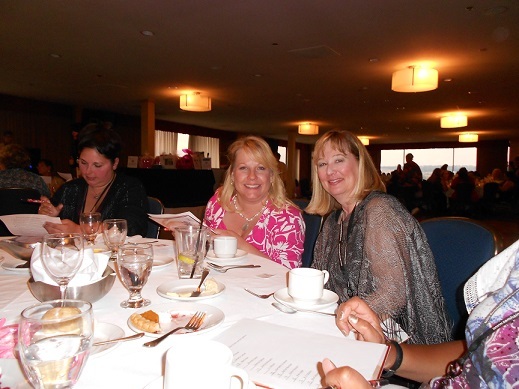 The next event I attended strictly as a reader and mom. 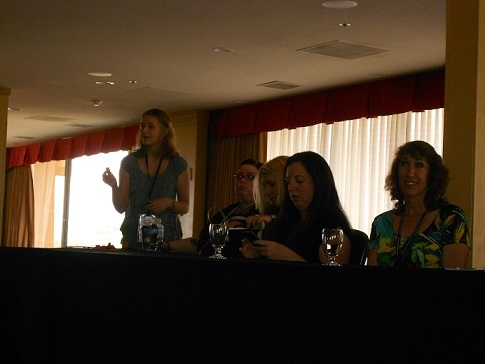 It was a wonderful moment when I walked into the Young Adult and “New Adult” Romance Chat/Mixer, where my daughter, JM Kline (far left in 1st & 3rd photo), had her debut moment as an author. She published a short story in December 2012 called THE CHRISTMAS SHIFT. She launched the first of her young adult Shadow Shifters series novels, SHIFTING DREAMS, two days before RomCon! My next event was What’s My Story?, an opportunity for readers to build a character from the ground up. I participated in, and moderated, this event so no pictures this time. Sorry! At least one author sat at each table with readers. Our mission? To uncover the story for one of four handsome male model photos. It was a difficult job but someone had to do it! 🙂 Toward the end of the hour, we read some of the stories we’d created. We came up with such fun, and very different, stories! I took an hour off to check out the vendor tables. Found some fun goodies, a gorgeous purple bracelet and a pair of mirrored “lure” earrings that really sparkled at Casino Night. I also added several new dragons to my collection. Have I mentioned how much I love dragons? Anyway, one dragon has a place of honor in my office. It’s a brass, cone-style incense burner. 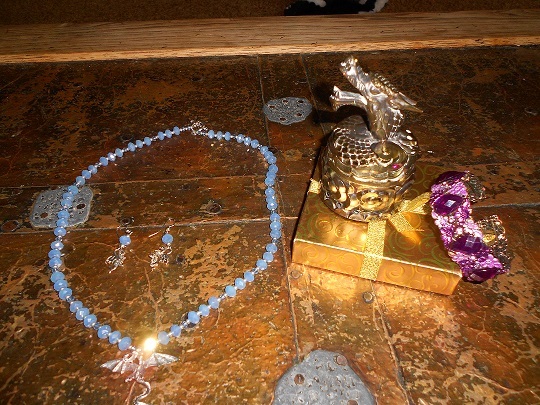 I can’t wait for my first opportunity to wear the blue dragon necklace & earrings. After exploring the vendor tables, I went to my daughter’s autographing session and sat with her, again the proud mama. 🙂 They raffled off all of the wonderful baskets and giveaways donated by authors, the proceeds going to breast cancer research. 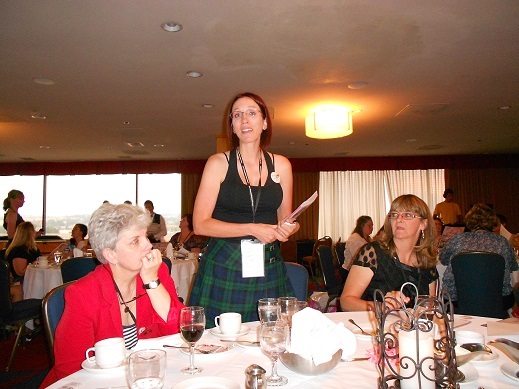 (See first RomCon 2013 Diary for a photo of my contribution.) Over $2,200 was collected! 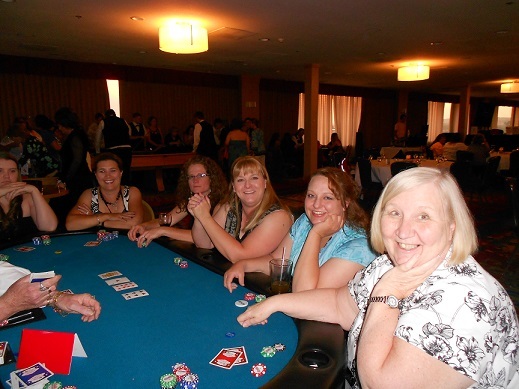 Saturday night was the Wild Rose Press Casino Night & Dinner Event. They sponsored a game around their authors, where we matched the authors with secret information. The authors went from table to table to share their secrets so we could check them off our list. Fun prizes were raffled. 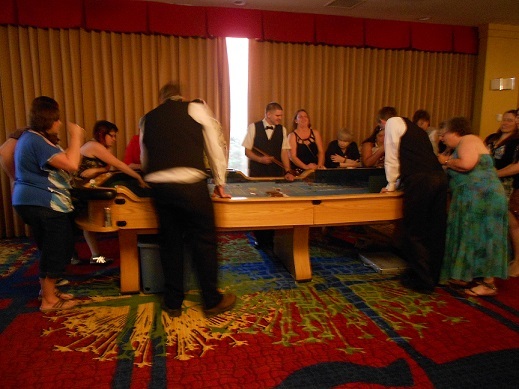 Many of us played at the casino tables set up for after dinner fun. There were poker tables, Blackjack, Craps and Roulette, and everyone played with fake money chips. The evening didn’t end there for many readers and authors. 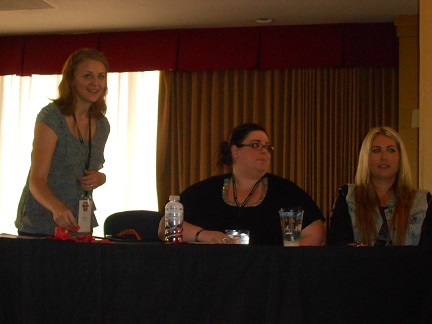 There was a Romance Idol Karaoke Challenge with celebrity judges, Heather Graham, Barbara Vey, Melissa Mayhue and Maggie Mae Gallagher. Singers competed for books. 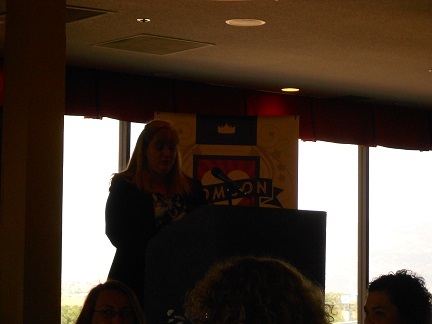 The RomCon 2013 convention culminated at the Reader’s Crown Brunch & Awards on Sunday morning. My romantic comedy, SATIN PLEASURES, was not only a Reader’s Crown Award finalist but entered in the 2013 RomCon Book Cover Contest. I was Cover #5. Readers voted by number through the weekend. It was exciting thinking about what I’d accomplished even if I didn’t ultimately win. 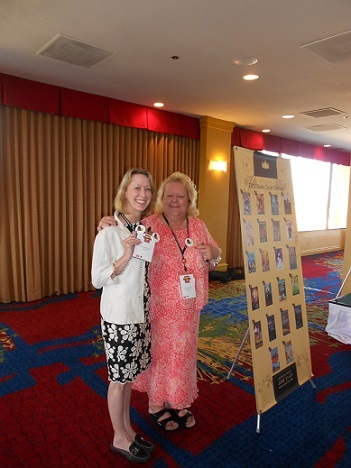 I was fortunate to meet Elizabeth Essex, standing with me near the book cover contest board. She was also a finalist in the Reader’s Crown Award in the Historical category. 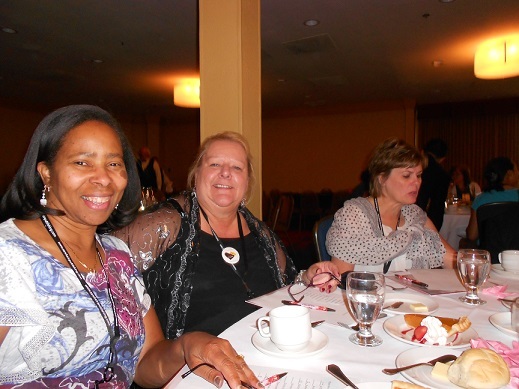 I was excited when RomCon organizer, Michele Callahan (left), announced that Elizabeth won her category. I didn’t ultimately win the Contemporary category but that’s okay. I’m just thrilled so many readers enjoyed my book. 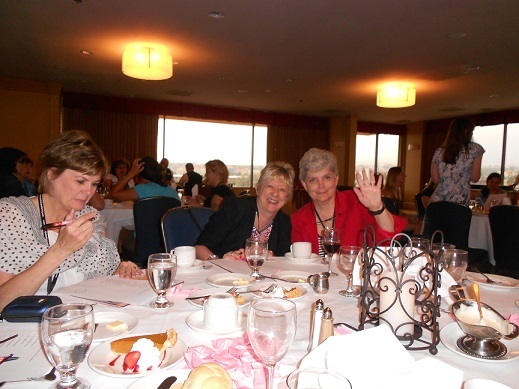 As you can see, we had a wonderful time at RomCon 2013, June 21-23, in Colorado Springs. Despite the heat. Despite the fires in the area. Yes, we had to deal with smoke in the air but we had so many reasons to stay in the hotel and just play. Thankfully, we’d had a couple of days of overcast days and rain that helped firefighters begin to get a handle on the fire that was raging near Colorado Springs the week before RomCon. Still, the smoke in the air was a constant reminder of what they were still fighting outside the city limits. I know I wasn’t alone in thinking about about all of the fires across our fair state. 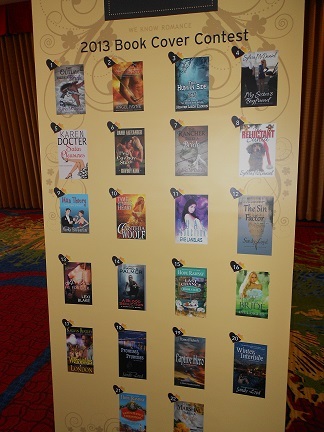 It was wonderful to meet so many readers and authors, connect with friends I’d made last year, and enjoy an entire weekend of celebrating our favorite reading material. Romance novels. I can hardly wait for next year and, if you didn’t have the opportunity to join us this time, I hope to meet you then. HAPPY READING and HAPPY FOURTH OF JULY, my friends! See you on Thursday for another rousing entry in Karen’s Diary Drop-In….